I wanted to share my all time favourite director, artist and mentor with you! He talks about Transcendental Meditation, creativity and peace. David Lynch, he is also the founder of the David Lynch Foundation. (TMfoundation) I hope this brings some peace within you in hard and stressful times, conscioussnes is one and the same. I do this technique and it really calms you down, relieves your anxiety about life. This meditation technique is so simple and beneficial. And i didn’t pay anything for it. Don’t believe the expensive courses. Close your eyes for 20 minutes, and repeat a meaningless word (mantra) in your mind. More information is on the video. I have been working really hard at practicing TM. I think it is a key ingredient to any kind of recovery, especially for those of us with major sleep problems. I do NSR meditation basically the same thing using a mantra. 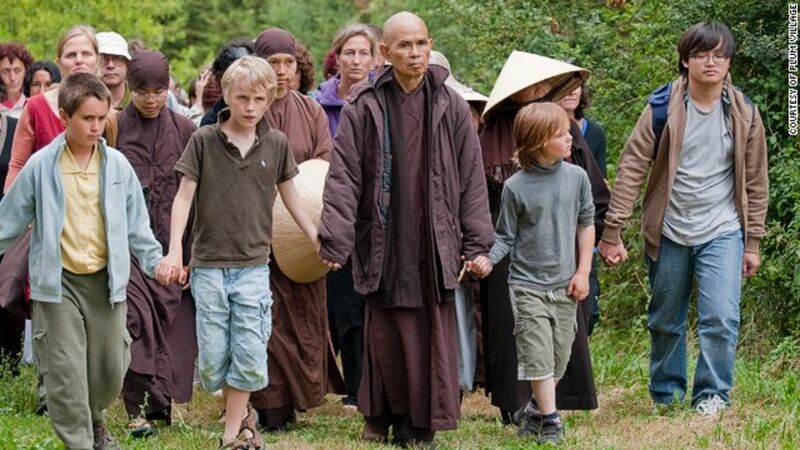 Hoping to meditate with monks at a local monastery at the weekend. I’m probably going to do a 3 day no phone meditation retreat this summer. Would love to go a whole month if I didn’t have to work. I didn’t do TM because it costs $1,500 to learn from a teacher. I googled this and found a monastery in France were you can stay for a few hundred bucks for a week with the monks. Adventure travel isn't always about riding waves and ascending heights -- sometimes it's about heading inside, to explore the realm of our inner worlds. What’s your meditation schedule like for the day? Do you find it helps before sleep? I meditate on the train ride home. I listen to insight timer for 20 minutes… sound can be a drone, monks, ocean crashing. What I discovered was the importance of the mantra. It needs to be a meaningless set of syllables. This helps your brain not think about the meaning of a mantra with actual words and get distracted. With practice you start to be able to shut down conscious thought and then reach almost a dream state. I was able to do it once so far for a couple minutes towards the end of a 20 minute session. It was pretty amazing… it was like a dream sequence but in fast forward but I felt like I fell asleep. When I was done I felt like I had taken a nap. From what I have read you can get to a very deep state of mediation that is more restorative than deep sleep. I’m hoping to work at this to counter my severe insomnia and stop taking so many different sleeping pills. I believe this will also promote brain healing. As for paying for a teacher… thats the downside of TM. It appears to be heavily ingrained with this money making side of it. Thats why they tell you to never share your mantra. Thats all BS from what I can tell. The original mantras were sayings from Sanscrit. From what I gather, once you understand the purpose of the mantra and how to develop one that works, you have learned all there is and you then just need to practice. The mantra can litterally be any gibberish that you like… some gibberish on the breath in… some different gibberish on the breath out. If you want a quick way to get to the healing visit a sensory deprivation tank, it’s a short cut to get you into healing. I did it the other week but found that I had memory issues the next day so I need to look into this. i did also feel happy and relaxed better than I had been in some time but the memory loss put me off from going back. By absorbing the epsom salts in the tank it should drive up magnesium levels and also your testosterone levels. So it depends how sensitive you are to this. One idea I had was to take something that lowers testosterone using the same mechanism that magnesium does so you get more of a balance. The last time something game me memory loss was an infrared light on my front cortex so I’m wondering if they act in the same part of the brain. I’ve downloaded that app, thanks. Do you use free or premium? During meditation for 30mins sometimes fears are revealed. This can also happen in the tank. In any case it makes me realise how we hold onto fears in the brain without really realising and these fears may be impacting on our sleep. This video is good https://www.youtube.com/watch?v=ESL2xeH5Ol4&pbjreload=10 he talks about using the correct therapy for the part of the brain that causes our anxiety or depression. He also suffers from depression and anxiety so probably has a good understanding of these things. But insomnia probably creates some fears in our brain that we might be unaware of but we need to work out. “From what I gather, once you understand the purpose of the mantra and how to develop one that works, you have learned all there is and you then just need to practice.” are you able to explain more about this or post a link. I’ve seen mantras linked to age but didn’t think much of it. I was given my own mantra. Have you tried Iris blue light blocker software? I have done a little research… it appears the mantras handed down from “teachers” where words from sanscrit. They work because you dont know what they mean. They are just sounds linked together. Its the same idea as Ommmmmmm … its to get your mind to stop thinking. I think that people get hung up on the definition of what they think “mantra” means… In this case mantra means nothing… which is ironic. TM is big business… the fact that any certified teacher wants $1300 to teach you something that only takes 4 days is absurd. TM is supposed to be a very simple practice. My mantra that I created is Gooz Venah . I say Gooz as I inhale and I say Venah as I exhale… This is done internally… you dont actually say it out loud. Focusing on the pronouciation distracts your brain from thinking about “stuff”. I have also seen the mantras that group age ranges. Even with those, you can see that they are just meaningless sounds. So that is the whole point (as far as I can tell). I encourage anyone else to chime in and correct me if I’m wrong on any of this. As for insight timer… I use the free version but I like it and might just buy premium to support what I think is a good app. I have f.lux which is a blue light blocking app running on all my devices. Once again… I dont think it matters much. My brain is GABA deficient. Thats the cause of my insomnia. Hopefully I will start to heal and get more GABA and rebalance, etc… I pray that I sleep normally again some day. I’m wondering if SAGE 217 would help kick start GABA production. I believe that is a major component of that drug. There is also a lot or research going into insomnia. Insomnia effects the more of the popluation of earth than anything else. Its a huge market. You will see a few other Dual Orexin Antagonistic drugs pop up in the next year. I believe Purdue Pharma is working on one. Also, there are some med tech devices that are being funded for research that have a very direct stimulation on the vagus nerve to treat a variety of issues including pain, insomnia, anxiety, arthritis. Medical advancements are happening at a staggering pace. I have no doubt we will see relief from the majority of these symptoms in the next 5 years. China will have CRISPR treatments in the next 2 years I believe. Thanks for explaining the mantras it makes sense that you’re not supposed to understand the meaning @Shellnyce I also have a lot of muscle twitches and can’t sleep. Maybe I need to look at GABA A agonists. Have you come across any safe agonists? At the moment I’m crashing if I take a drug although I’ve not tried the ones you mentioned. I did try L theanine and felt very relaxed from 10mg. I’ve tried kimchi / sauerkraut to increase Gaba but it’s not worked. What I understand of GABA is this… You have actual GABA and you have GABA receptors. When GABA binds to GABA receptors you get the sleepy effect. There are 3 types of receptors (A, B and C). The most common is A…which is agonized by alcohol, benzos and Z drugs. They all effect that receptor set a little differently but ultimately they are GABA A agonists. They dont create GABA… they just bind to the receptor and act as GABA creating a similiar effect. GABA B receptors are most commonly effected by Phenibut. Phenibut also mildly agonizes GABA A when used in large doses from what I understand. So to answer your question… None of it is “safe” . Long term alcoholics end up with insomnia because when they stop drinking and remove the alcohol which was getting used in place of actual GABA to put them to sleep, their body no longer creates enough GABA to help them sleep so they have a deficiency. However in our case… we already are low on GABA to start with. So I think the strategy should be to take as little of a GABA agonist as possible. Just enough to help quality of life and stay sane but maybe not every day…who knows. ALso… while I’m not any kind of doctor but have done lots of research, I think cycling things helps keep tolerances down. For instance if you were to Use an anti histimine a couple days a week, a GABA A agonist a couple days a week, a GABA B agonist a couple days a week and possibly a canabnoid agonist like weed a couple days a week… you may have a better shot at getting sleep and not building a tolerence or dependency on any one type of GABA agonist. I met a guy on here @basementdweller who does something like this. Lastly… I did some reading on GABApentin… this drug acts as an agonist but also helps the body synthesize GABA. I think it may be the only drug that does this. It may be worth looking into. I took some GABApentin one night and I definitely got decent sleep. I didnt continue with it because it made me feel like my breathing was depressed possibly due to the fact that I was taking it with Remeron. I have sinced lowered my dose of Remeron so I might revisit GABApentin at some point. Once again… I’m not a doctor but have researched lots of this. I encourage anyone to correct me on anything that I stated which might be wrong or not totally accurate. @Shellnyce Appreciate you taking the time to share your research. I was wondering if you have looked into Lithuim as a sleep medicine in low doses. It raises allopregnanlone which we seem to be low in. Some reviewers of the supplement Lithium orotate report feeling sleepy. I have heard of Lithium and know that it is very strong stuff. I will check out your link. I think at the time I was desperate for sleep and would have swallowed a cow if I thought it could help me you might find a white noise box helpful also take a look at the delta waves on YouTube. So has your sleep improved over time? Not much it scares me. I went 10 days without sleep which is the shortest time the rest have all been longer. However after the 10 days I slept twice in 3 days which I’ve not been able to do since I crashed. I have also dropped potatoes or any high carbs in my diet. I noticed that the night I slept I just ate root veg, salad and meat. I’m not touching any thing for sleep as drugs/supplements make me crash even in small doses.